Greens in a Garlic Tahini Sauce with Tofu. Umeboshi vinegar adds a delicious lemony and salty flavor to the sauce of this nutritious, quick and easy non dairy, vegan dish. 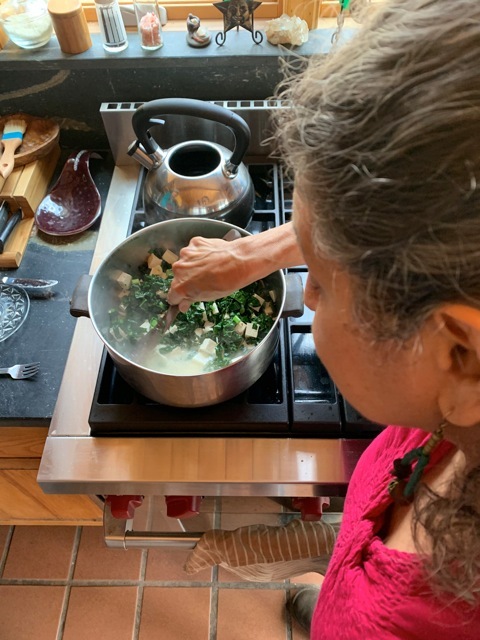 Here I am demonstrating how to push the greens aside in the pot when adding organic tahini to the greens and tofu. 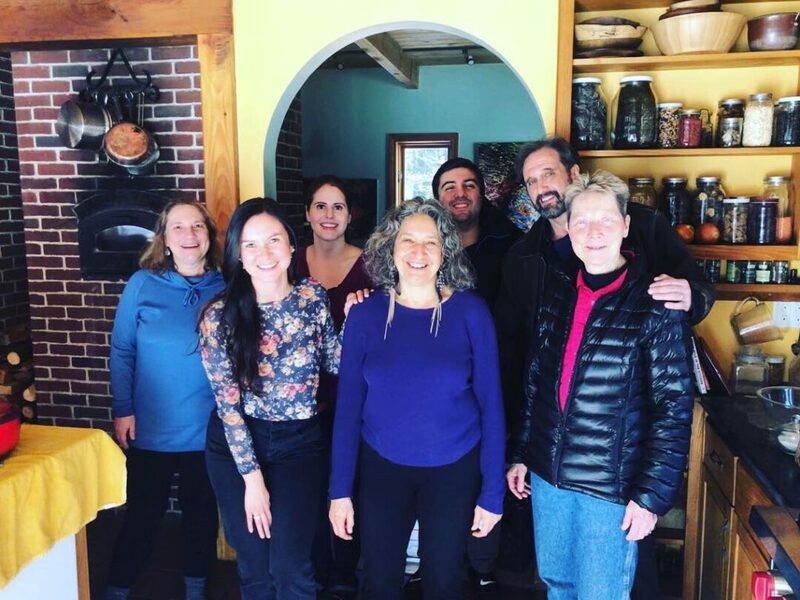 Thanks to Pat Antaya6 for coming to my hands on vegetarian cooking class for health and longevity and taking this photo. This entry was posted in Blog, Cooking Tips and tagged cooking, cooking class, delicious, easy, eat well, Farm to Table, Food, fun, garlic, gluten free, gourmet getaway, greens, Healthy, healthy food, healthy life style, learn, leslie cerier, longevity, Organic, personal chef, plant based, pleasure, Recipes, sauce, selfcare, sustainable living, Tahini, teach, The Organic Gourmet, Tofu, ume, Vegan, vegetarian on 04/22/2019 by Leslie Cerier. Demonstrating how to make an Asian stir fry tempeh with vegetables in one of my hands on vegetarian cooking classes. First, melt virgin coconut oil, Next add your spices: grated ginger and chopped garlic. Add and stir in a tablespoon of tamari and mirin (sweet rice cooking wine) or maple syrup along with slices of tempeh. Once the pan dries, add some water for a juicy, flavorful dish. Next add colorful vegetables like carrots, green cabbage, and celery. 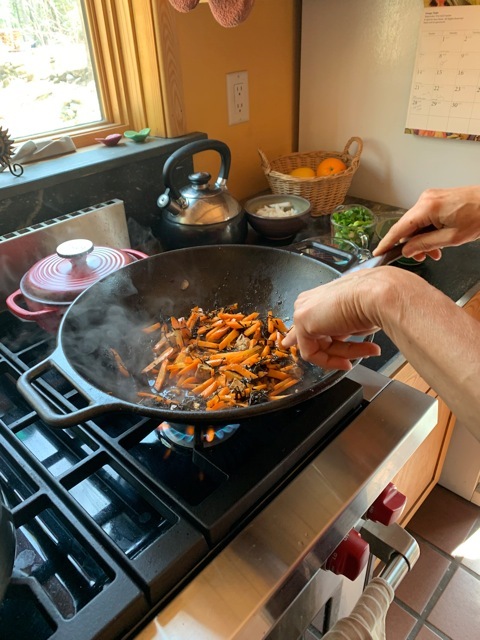 In my cooking classes, I teach that you can change the combination of seasonal vegetables all year long for infinite varieties of tasty Asian vegetable stir fry dishes. I also offer cooking tips for you to invent your own recipe variations. Once you understand which ingredients go in first, second and third, you can design your own stir fries based on your local harvest. Eat well and have fun. This entry was posted in Blog, Cooking Tips and tagged cooking, Cooking Classes, delicious, delight, eat well, extra virgin coconut oil, Farm to Table, fun, gluten free, Hands on cooking class, Health, leslie cerier, longevity, lunch, maple syrup, mirin, Nutrition, Organic, personal chef, pleasure, Stir Fry, tamari, Tempeh, Vegan, vegetable, vegetarian, YUM on 04/22/2019 by Leslie Cerier. Marinated sun-dried tomatoes and kalamata olives make this a delicious spread for bread or crackers. 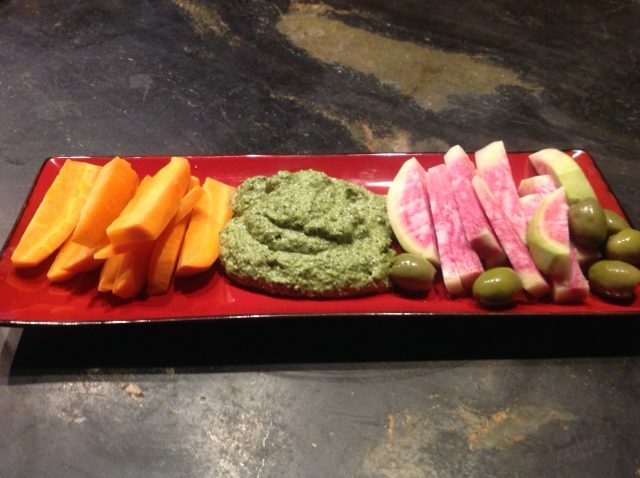 And, it is fabulous as appetizer dip served with rainbow radish and carrots sticks. Organic green olives adds to the YUM and Fun. Served on my Vegan Gourmet Getaway Weekend. This entry was posted in Appetizers, Blog, Gluten-Free, Recipes, Vegan and tagged appetizer, cilantro, Cooking Classes, delight, dip, extra virgin olive oil, Farm to Table, Fresh, garlic, gluten free, Gourmet, Healthy, healthy food, healthy lifestyle, leslie cerier, local, Marinated Dried Tomatoes, miso, Olive Oil, OLives, Organic, personal chef, seasonal, spread, sustainable, Vegan, vegetarian, YUM on 04/15/2019 by Leslie Cerier. Always happy to hang out in an organic farm and garden. Here I am before teaching a hands on farm to table, vegetarian, dinner class at the Organic Spa Rancho La Puerta in Mexico. Grateful to teach folks how to mix and match the fresh, local, harvest into tasty easy, delicious healthy meals for health and longevity. This entry was posted in Blog and tagged beauty, Chef, Cooking Classes, delight, easy, eat, educator, Farm to Table, gluten free, Health, Healthy, healthy life, kale, leslie cerier, longevity, meals, Organic, Organic lifestyle, palate, personal chef, Rancho La Puerta, slow living, sustainability, sustainable, teacher, Vegan, vegetarian on 04/15/2019 by Leslie Cerier. 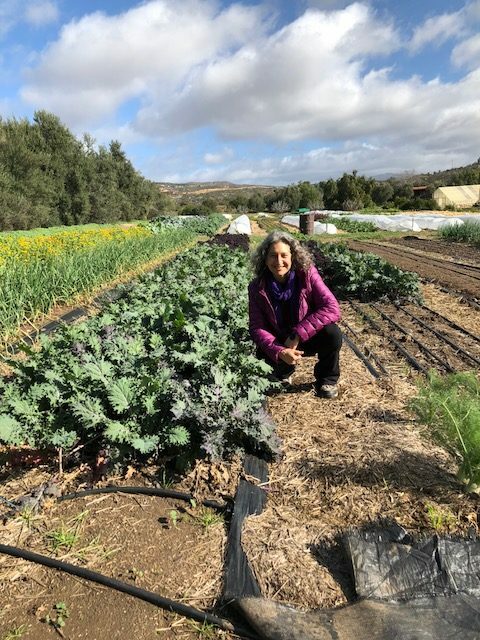 This entry was posted in Blog and tagged amazing, Cooking Classes, delight, experience, Farm to Table, gluten free, Hands on cooking class, Healthy, healthy life, herbs, holistic, leslie cerier, Organic, palate, personal chef, Spices, Vegan, vegetarian on 03/25/2019 by Leslie Cerier.